Matty Dawson-Jones has confirmed that he has played his last game for Leigh and will move onto pastures new next season. The 28-year-old has been at the Centurions since he joined from St Helens in 2016, making over 60 appearances for the club. But with the club facing financial difficulties, Dawson-Jones has admitted he played his final game for the club in their Championship Shield final defeat to Featherstone Rovers on the weekend. “Not the way I wanted to finish my time at Leigh Centurions on Sunday, and it was made a little worse that I broke my hand during the game,” he posted on Instagram. “I just wanted to thank all the Leigh fans how they’ve been with me over my two and a half years at the club. “It’s certainly been a rollercoaster but getting promoted to Super League with the club is one of my best achievements in my career so far. Not the way I wanted to finish my time @leighcenturionsrlfc on Sunday, made a little worse that I broke my hand during the game. Just wanted to thank all the Leigh fans for how they’ve been with me over my 2 and half years at the club. It’s certainly been a rollercoaster but getting promoted to SL with the club is one of my best achievements in my career so far! Hopefully things will turn around and the club will get back to where it belongs soon, you fans deserve it! 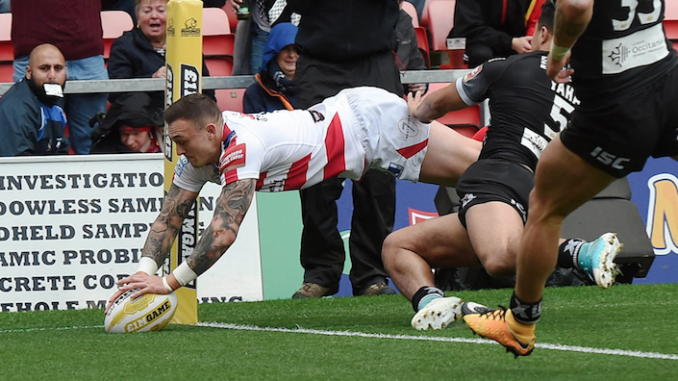 Dawson-Jones came through the ranks at Huddersfield Giants, before signing for Saints, where he scored 16 tries in 50 games. He has recently been linked with a move to Super League side Hull FC for next season.